Russian Foreign Minister Sergey Lavrov said Moscow expects Kiev to do everything it can, without political considerations, to protect Sberbank's offices in Ukraine. The bank’s head office suspended work on Monday due to a disruption by Ukrainian radicals. "As far as I understand, the management of Sberbank has already officially reached relevant competent authorities of Ukraine to stop attempts to hamper their normal activities," said Lavrov. He added that Ukraine’s law enforcement is obliged to protect banks. According to the minister, "lynch mobs are intolerable; it violates the law and undermines the property rights protected by Ukrainian legislation." 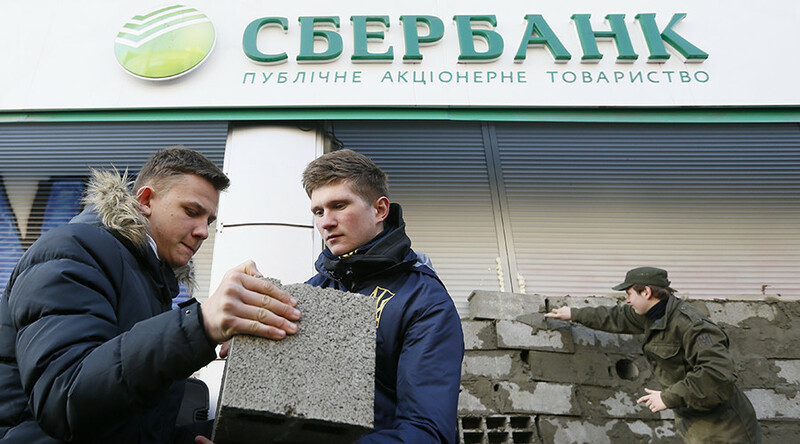 Sberbank’s head office in Kiev shut down for security reasons on Monday after Ukrainian radicals bricked up windows and entrance to the branch. According to TASS, the office on Vladimirskaya Street in the Ukrainian capital was attacked by members of the Azov voluntary battalion and the radical group Right Sector. Activists proclaimed similar treatment awaits other Sberbank offices across Ukraine until the bank leaves the country, and demanded the Russian bank stops working in the country. The National Bank of Ukraine (NBU) said if information on providing such services is confirmed, sanctions could be imposed against the lender. Ukrainian President Petro Poroshenko is expected to discuss the issue on Wednesday with the National Security Council. Ukrainian unit PJSC Sberbank was founded sixteen years ago, with Sberbank as the sole owner. According to NBU, as of July last year, Sberbank was 7th among the country’s 108 banks by assets.